Remember chat rooms from back in the day? Digimon Story begins with a short video showcasing EDEN; a chat room where people meet in avatar form and you begin by meeting up with some of your online friends there. This is where things pick up as you meet and befriend digital monsters (Digimon) before something horrendous happens. A monster called an eater attacks you while you try and log out and this causes you to remain in a state of digital limbo in the real world. Kyoko, a detective, rescues you from the middle of the street and this is where your tale properly begins. When it comes to depth, the plot is nowhere near the genre greats but it was interesting enough for me to plow through the complete story with a ton of grinding that I ended up doing for fun. The main problem I had with the plot is in the pacing. Persona 3 had this issue as well but I found the story there so much better than Digimon Story Cyber Sleuth in every aspect. Progression occurs through various locations in the digital world and the real world. I love when games try to recreate portions of a real city or something that feels like a lively town. Akiba’s Trip replicating Akihabara (including even game trailers being played while you walk around) and Grand Theft Auto V’s Los Santos are two extremes and some of my favourite locations in gaming. 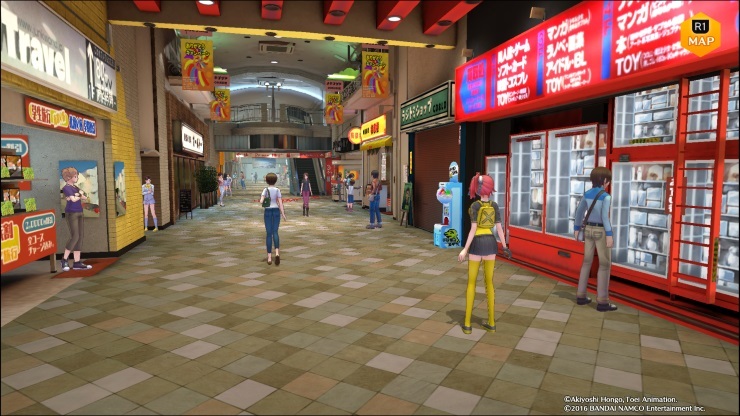 Cyber Sleuth takes place in various locations in Tokyo and the only real problem I have with these is the invisible walls that stop you getting a true open-world feeling. You spend time solving cases at the detective agency along with progressing the story. These cases have you explore different areas in various fetch quests or defeating certain Digimon in the digital world among other things. The actual battles make up a large portion of what you do in Cyber Sleuth and they are proper turn based battles. These occur randomly in dungeons or during story events. The Battle user interface is really nice although I wish it was tweaked a bit for the larger screen as it still looks like a handheld interface on a large screen. Outside of battles there are tons of areas for you to gain experience, like the Colosseum and each battle with a particular enemy brings you closer to having properly scanned it for the DigiLab. The DigiLab reminds me of the Velvet Room in Persona games. You can Digivolve your Digimon to stronger ones at the DigiBank or access previous dungeons to train as well. The DigiFarm lets you send out Digimon to train or hunt down new cases for you. You can also access online battles against people across the globe from the DigiLab. I spent a good amount of time just grinding with auto battle on to gain experience to Digivolve and if you’re a stat fanatic, you will lose your mind here with what is possible. I wish auto battle just attacked instead of using special attacks though so it would not waste SP. Visually, it has a lot of good things going on. I love the character models of the main characters and mostly all the environments. It is evident that the PS4 version of the game is just the Vita version prettied, though, up as many assets are blurry and sometimes things look rather inconsistent. Dungeons look great and are the only redeeming factor for them when you have to go through the same one multiple times for something. The actual Digimon designs are good as well and it is hilarious seeing something cute Digivolve into a larger version with machine gun arms and so on. Masafumi Takada of Danganronpa fame did the music for Cyber Sleuth and he hit it out of the park with this one. The music is catchy and never gets monotonous even when you spend hours grinding in a dungeon – I dare anyone to listen to the main theme and not hum it later. The other drawback is the lack of an English dub. While the Japanese voices are great, there are many sections where there is no voiced dialogue or audio cue at all for what is being spoken. I’d have loved a dub but understand why it wasn’t done. No excuses for not having proper audio cues or more dialogue voiced though. Maybe the next Digimon game released in English will have them go the extra mile. 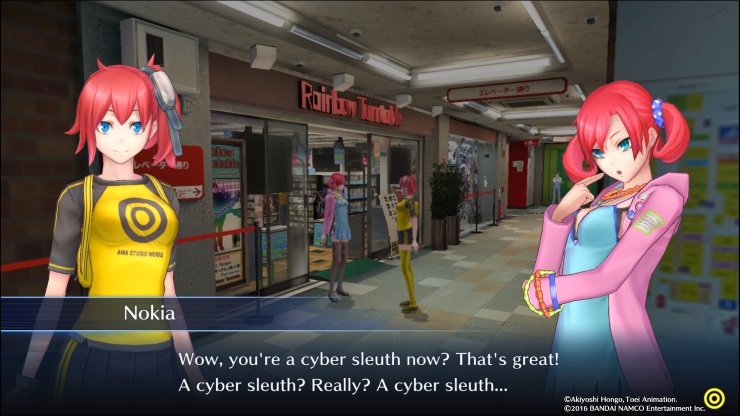 Digimon Story Cyber Sleuth is fun but lacks a bit of polish that would have made it one of the best JRPGs in the last few years. Glaring localisation issues and the lack of attention to visual detail hold it back from true greatness. In many ways Digimon feels like it was made for fans of games from the 90s but attuned to modern tastes and grown up people. As a huge fan of the Shin Megami Tensei mainline franchise, Persona franchise, and Danganronpa franchise, Digimon Story Cyber Sleuth knew exactly which buttons to push to make me happy. If you’ve been craving an old school JRPG but can look past the issues, look no further. Don't let us be your little secret: SHARE!